(Bloomberg) -- Today in Brexit: Tonight isn’t a re-run of the meaningful vote, but the votes will be packed with meaning. We’re back in the House of Commons tonight, two weeks after members of Parliament resoundingly rejected Prime Minister Theresa May’s Brexit deal by 230 votes. This time lawmakers are angling to seize control of the final stages of Brexit. Rival camps are trying to turbo-boost their version of the future. The outcome could shape the direction of the final weeks before Brexit day on March 29. Tonight’s votes are not another chance for MPs to weigh in on the prime minister’s deal. Instead lawmakers are being asked to vote on a procedural motion. May has pledged to offer another “meaningful vote,” further down the line, her spokesman has said. But events could run away from her before then. If they’re not voting on the deal, what are they voting on? In theory tonight’s motion is a routine matter. But before Christmas MPs won the right to propose amendments to so-called “neutral motions” related to Brexit. That means a normal government motion has turned into a pitched battle between competing visions of the Brexit endgame. Two rival factions in Parliament are trying to take control. If one wins, Brexit will probably be put on hold. If the other wins, May will probably head back to Brussels in an effort to renegotiate the most controversial part of the divorce deal — the Northern Irish backstop. We don’t yet know which amendments will be chosen for a vote tonight. That decision lies in the hands of Speaker John Bercow. His verdict will be delivered around midday in London, and could shape the final outcome. There are two main contenders. Labour’s Yvette Cooper and Conservative Nick Boles want to force May to delay Brexit day to avoid crashing out on March 29, a move that has a good chance of passing if Labour supports it. Tories including Andrew Murrison and Sir Graham Brady want to send May back to Brussels to renegotiate the Irish backstop. In a dramatic move late on Monday, May and her government urged Conservatives to back this plan, effectively abandoning the agreement she’s spent 18 months negotiating. 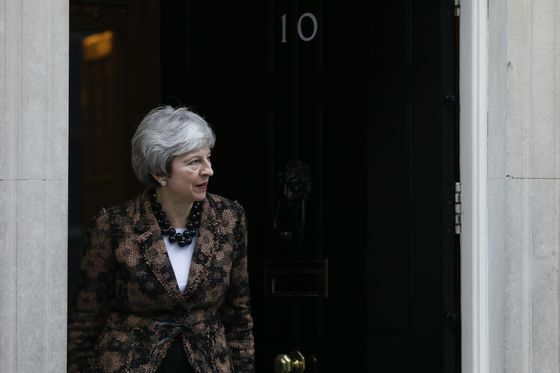 May’s move is intended to win over hardline Brexit backers and send a clear message to Brussels on which changes would help a deal get through Parliament, Bloomberg’s Tim Ross, Kitty Donaldson and Robert Hutton report. It’s a high-risk approach. Many hardline Brexiteers were unpersuaded, and May’s move risks bolstering support for the Cooper-Boles plan. On Monday night a rival plan emerged from talks between the euroskeptic European Research Group and pro-EU Tories including former minister Nicky Morgan. In Brussels, key players were unmoved. Sabine Weyand, who led the EU side in Brexit talks, said on Monday that goings-on in Westminster this week felt like “groundhog day” and European Commission spokesman Margaritis Schinas insisted the divorce deal would not be reopened. Some European Union states are weighing up what preconditions they could demand in exchange for a request to delay Brexit, Dara Doyle and Birgit Jennen report. Theresa May should give up on her Brexit deal and listen to other politicians about the way forward, writes Rachel Sylvester in the Times. It may take more than a delay in Brexit to lure foreign funds back to U.K. stocks, a market that’s been deemed by some strategists as “uninvestable,” Justina Lee reports. Death by Brexit? | Thousands more could die from heart attacks and strokes due to rising prices for fruit and vegetables after Brexit, research suggests. A no-deal Brexit would have the worst impact, leading to more than 12,000 extra deaths between 2021 and 2030, according to a study by Imperial College London and the University of Liverpool. Leaving | Bank of America Corp. will start moving about 400 staff, mostly from London, to its Paris office in the next few weeks as the bank prepares for Brexit, according to a person familiar with the matter. Lambing | U.K. farmers’ confidence has slumped as Brexit uncertainty leaves growers unsure of who they’ll be able to sell to and how to plan for the future, according to the National Farmers Union. “There will be British farmers out there lambing now with no guarantee about what market they will be selling into in three months’ time, let alone a year or two down the line,” NFU President Minette Batters said in a statement. On the Markets | The pound could hit levels not seen in six months if the Cooper-Boles amendment is passed, fund managers and strategists say. 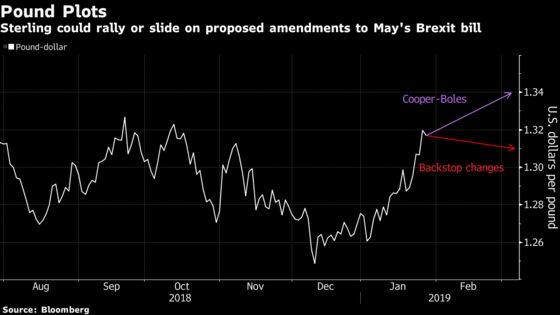 Passing an amendment to delay Brexit could send the currency soaring to $1.34, while the Murrison/Brady approach could pull the pound back down to $1.31. Sterling was at $1.3157 early on Tuesday.